Four 11 x 17 Point-of-Sale Posters, featuring your book cover and text you supply, FREE with your order of 200 or more perfect bound books or coil bound workbooks. Mention the code WEB FOR SEMINAR to your Publishing Consultant when you place your order. Do you make public presentations? Conduct workshops or seminars? What will the attendees take away from your presentation? An accurate memory of your presentation or your book? Will they scribble on a little scrap of paper or the work book that came with their ticket? Will there be booklets on several specific topics that have been covered in your two day workshop, or will they attend, listen and forget? Paper lasts. Paper encourages listening and active involvement. That’s why your teachers required you to take notes. Help the people who attend your presentation remember what they learned and why they spent money to come and hear you speak. 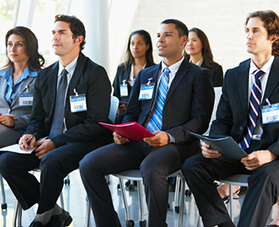 Give them something they can share with people they work with, who may attend your next seminar. Plan your materials carefully, produce them professionally, and you will extend the reach of your influence across time and space, and may reach people who were unaware of your expertise. –If you have a great deal to say, consider breaking the material into several smaller books. A 300 page book on multiple or complex topics can be intimidating to read and to afford. Smaller books, presented as a series, can be specifically targeted and very affordable. –Workbooks’ usability increases with comfortably generous spaces to write notes and answers; coil binding to allow the workbook to lay flat; and bold type used sparingly to orient the user to the topics being addressed. –8.5 x 11 is a good size for a workbook. Make sure your layout includes generous margins so that type or important material does not end up in the binding area or too close to the trim edge. –Make sure your book has an intriguing and relevant cover to attract the attention of potential purchasers. Plan for point-of-sale posters that can attract attention and sell for you.